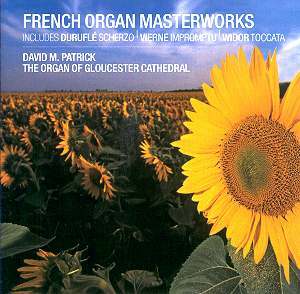 David Patrick presents here a pleasant and often exciting collection of French bonbons, on the organ of Gloucester Cathedral. To my mind the Gloucester organ has become more raucous and a touch less beautiful since its rebuild by Nicholsons in 1999. That said, some softer colours, especially the strings and certain flutes, remain enthralling. Still, it�s a lazy choice for such a disc, pseudo-French it might be, but, despite its iconic status, and occasional aesthetic conviction, especially in the music Durufl�, its reeds tire the ear much more quickly than the real-deal Cavaill�-Coll. The organ suits the playing of David Patrick well. His approach is characterised by a truly phenomenal technique, and ear for colour, both of which are highly impressive. His quicksilver account of the Durufl� Scherzo in particular is astounding, and his generally bristling approach also gives Grison�s daft Toccata the kick it needs to make it reasonably exciting. Elsewhere his haste serves the music less well. The famous Widor for instance is too fast for the articulation marks, which the composer indicates, especially in the left hand at the outset. Widor�s own tempo marking of crotchet = 100 is really spot on as far as I am concerned. I find also the Impromptu of Vierne is, while dazzingly quick, in danger of being reduced to an etude. These tempi are possible on an electric action but impossible, and unmusical on the great 19th century French instruments, with their Barker Lever mechanisms. Patrick also has a good sense of atmosphere when needed though, particularly evident in the 2 Chorals of Jehan Alain. David Patrick incidentally is a freelance recitalist, who began making noteworthy recordings in the 1970s � his Buckfast Abbey LP of Durufl�s Suite on Cathedral Recordings (CRMS 867) remains impressive. He studied, among others, with Nicholas Danby. Especially attractive about this release is the inclusion of some unknown repertoire. I especially liked the little Scherzo by Samuel Rousseau, one time colleague of C�sar Franck at St Clothilde. The Toccata by Joseph Bonnet on the other hand has to be one of the least interesting examples of the genre, little more than a concert-study. The organ is captured well by Paul Crichton, and features an informative booklet. This is an attractive recording, well played, exciting and atmospheric on the one hand, but perhaps lacking a little in space and grandeur on the other, especially in Widor-era repertoire, the result of the instrument, and the way in which it is handled. But this is not hard to recommend for lovers of the repertoire, and I�m genuinely curious to hear David Patrick make a recording in France!